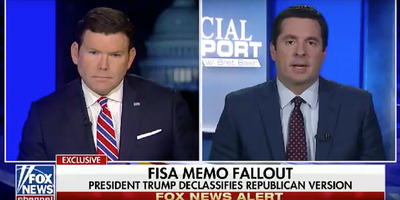 Screenshot via YouTube/Fox NewsDevin Nunes appears on Fox News, Friday February 2, 2018. Devin Nunes, the congressman who authored a disputed memo alleging improper surveillance of Trump associates by the FBI and the Department of Justice, admitted he didn’t view the underlying intelligence on which he based the memo. Nunes made that assertion during an interview on Fox News Friday, hours after the memo was released to the public. Nunes’ remark confirms statements made by his Democratic counterpart on the House Intelligence Committee, Adam Schiff, who argued that Nunes was not forthcoming in the process of producing the memo. The House Intelligence Committee chairman Devin Nunes admitted on Friday that he did not view the underlying intelligence on which he based a memo that accuses the FBI and the Justice Department of improperly surveilling Trump associates during the 2016 election. 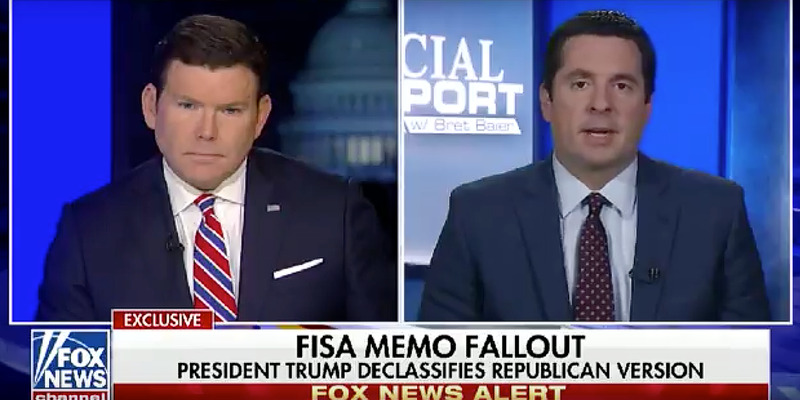 Hours after the memo came out on Friday, Nunes gave an interview on Fox News during which anchor Bret Baier asked him if he wrote the memo. “Yes,” Nunes replied, saying other Republican lawmakers, like House Oversight Committee chair Trey Gowdy, also contributed. “Did you read the actual FISA applications,” Baier asked, referring to the documents that the memo cites in part as evidence of improper conduct by US law-enforcement officials. “No, I didn’t,” Nunes said, before adding that Gowdy was part of a designated group that reviewed the intelligence, took notes, and reported it back to committee members. He continued: “I didn’t want to have to do this, but the sad part is that I have an obligation to the American people when we see FISA abuse,” Nunes said referring to the process by which federal officials seek authorization for domestic surveillance. President Donald Trump declassified the memo and authorised its release on Friday. It came out soon after. Among its several claims, the memo alleges that top US law enforcement agencies improperly surveilled the former Trump campaign adviser Carter Page, who was one subject in the investigation of Russian meddling in the US election. The memo accuses FBI and DOJ officials involved in the Russia investigation of acting out of bias against Donald Trump. The document has been widely disputed by current and former officials from the FBI and DOJ, and by Democratic lawmakers, who characterise it as an attempt to cast doubt on the federal agencies investigating Russian interference.